A sprawling example of grandiose Rococo design, the Catherine Palace is a major tourist attraction located outside of St. Petersburg. The ​Catherine Palace​ in Russia. The Catherine Palace is a magnificent Rocco palace in Tsarskoye Selo south of St Petersburg. The palace was named after Catherine I who was the wife of Peter the Great. Catherine succeeded her husband after his death in 1725. 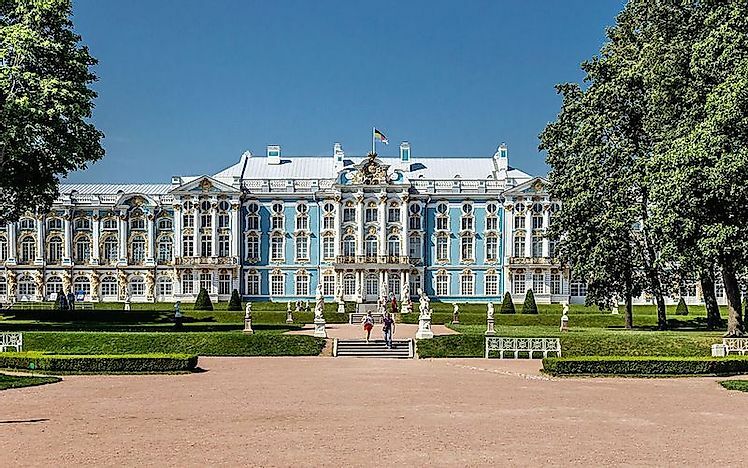 The Catherine Palace Museum covers a 300-year history of the palace including the architects involved in its construction and decoration and also the successful restoration work after the Second World War which led to the destruction of 58 halls. 32 halls have so far been recreated with the ongoing work on the remaining 26 halls. The building of the original two-storey building was commissioned in 1717 by Peter for Catherine I. Catherine I subsequently hired an architect to construct a palace for her summer pleasure. In 1733, Empress Elizabeth who was Catherine I’s daughter ordered for the expansion of the palace. In 1752, she found her mother’s residence outdated and requested her court architect to demolish it and replace it with a more colorful Rocco style. The construction of the new structure lasted four years with the architect presenting a new 0.2-mile long palace to the Empress. Over 220 lb of gold were in used to create the numerous statues erected on the roof. Two Rocco-styled circumferences flank the entrance to the Catherine Palace. Catherine I ordered the suspension of works on some statues in the park that were being covered with gold because he considered them old fashion. The interior of one wing of the palace was refurbished in a Neo-Palladian style. The palace was abandoned upon the death of Catherine in 1796 for Pavlovsk Palace and Alexander Palace. The Great Fire of 1820 which destroyed a section of the Catherine Palace necessitated its refurbishment. The Germans also intentionally destroyed the palace during the World War II leaving a hollow shell of the palace with the reconstruction work still ongoing. The interiors of Catherine Palace are spectacular. The Golden Enfilade rooms form the focus of the palace tour. The neoclassical interiors are a reflection of the 18th-century art. The Golden Enfilade starts from the Grand Hall with a uniquely painted ceiling. The Grand Hall is an official apartment that was designed between 1752 and 1756 and was intended for receptions such as formal dinner. The dining room for the courtiers in attendance is just after the Great Hall. The dining room is lit by four windows overlooking the courtyard. The White Formal Dining Room is opposite the courtier dining room and was used by the empresses for dinner. The Portrait Hall is decorated with portraits of Empress Catherine I and Elizabeth Petrovna. The Green Dining Room on the northern wing was badly damaged during the 1820 great fire. Other rooms within Catherine Palace include the Amber room, the Waiter’s Room, Blue Formal Dining Room, Chinese Blue Drawing Room, and the Choir Anteroom. Where Is The Jantar Mantar, Home Of The World's Largest Sundial?